Extinction. It happens. In fact, scientists estimate that 99% of all species that have ever strutted, slithered, swum, fruited, flitted or flowered on earth no longer exist. Cataclysmic events like asteroid hits, smashing continents and massive volcanic eruptions have already caused 5 mass extinction events over the last 4.5 billion years, each wiping out 50% to 90% of extant species. So why do some people currently get so het up about the extinction of a pretty bird species here or a weird-looking fish species there? Because it’s personal this time. After only 200,000 years on the planet our poor homo sapien habits have disrupted 65 million years of peaceful evolution to trigger the 6th mass extinction. That is, this time humans are not only the major cause, we’re also a likely casualty. Let’s face it, being at the top of the food chain matters not if there’s nothing underneath. Mangrove Circle of Life. 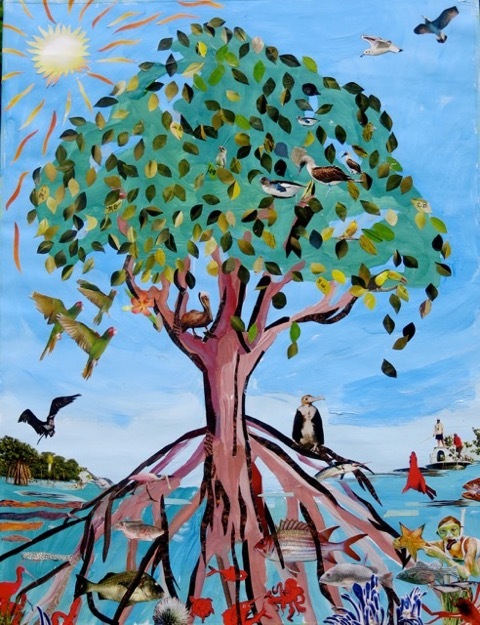 Collage by Tori Sepulveda and her students Monica Devine, Carol Bailey, Susan Willison, Joanna Spinoza, Christina Douglas and William Dubroraw. In other words, we need to get our collective act together. The study concludes, “Avoiding a true sixth mass extinction will require rapid, greatly intensified efforts to conserve already threatened species and to alleviate pressures on their populations – notably habitat loss, overexploitation for economic gain, and climate change.” It’s perhaps not surprising that two of the study authors are Mexican, as Mexico is one of the most biodiverse countries on the planet, and actually is considered mega-diverse – one of only 17 countries in the world with 70% species diversity. 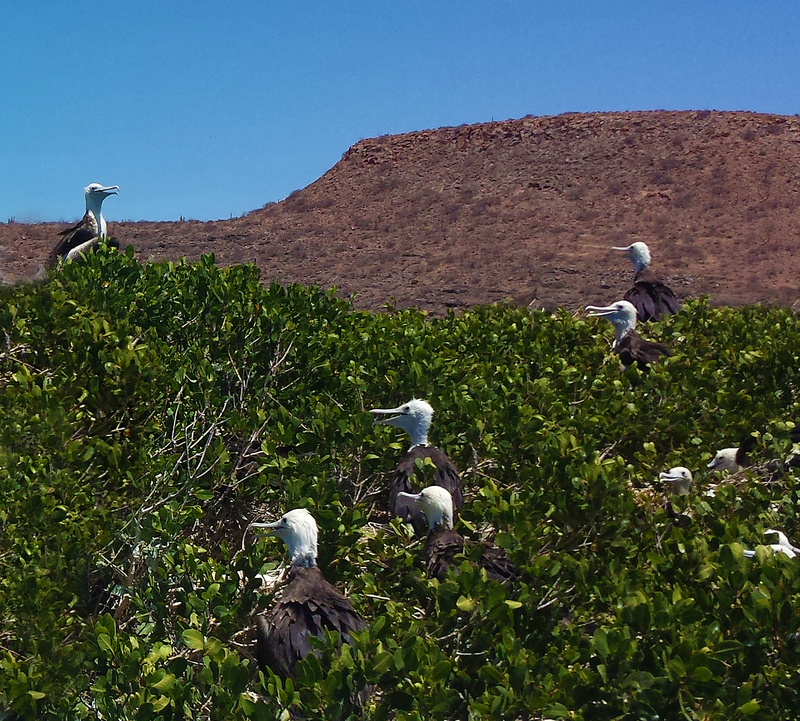 And here in Baja California Sur, mangroves are one of the most biologically important ecosystems in the state. In fact, mangroves are one of the most productive and biologically complex systems on the planet. Mangroves are arboreal amphibians – salt tolerant trees that have evolved to bridge land and sea in tough coastal environments. They cover over 700,000 hectares (over 1.7 million acres) of the Mexican coastline, which is 5% of the world total – only the huge coastal countries of Brazil, Australia and Indonesia have more mangroves than Mexico. And they don’t just look cool, they are a full service life support system, providing food, refuge and breeding grounds for numerous crustacean, fish and bird species, waste processing and pollutant filtering for good ocean and wildlife health, and hurricane and storm surge protection for coastlines and coastal communities; with roots deeply embedded in mud, mangroves can absorb up to 90% of a wave’s energy. On top of all that, they’re a heckuva lot of fun to explore recreationally. Dr. Octavio Aburto of the Scripps Institution of Oceanography has calculated that these services can reach an annual value of US$100,000 per hectare, which means that every year, Mexico’s mangroves contribute up to 70 billion dollars to the national economy. * Even Donald Trump would call that a lot of money. Yet every year humans clear thousands of hectares of mangroves in Mexico to make way for tourism developments, shrimp farms and other agro-industrial developments, giving Mexico the dubious distinction of having one of the highest mangrove deforestation rates in the world. Dr. Exequiel Ezcurra, Director of the Institute for Mexico and the United States at the University of California laments, “This short-term vision ignores the losses for society that are generated by degrading such a valuable ecosystem.”* Dr. Aburto and Dr. Ezcurra predict that, at current deforestation rates, in 25 years close to 50% of Mexico’s mangroves will have been lost, and countless more species will succumb to habitat loss. To put this into perspective, the World Wild Fund for Nature (WWF) estimates that the planet lost 50% of its wildlife in the past 40 years, and that habitat loss is the greatest threat to all remaining species. Dr. Patricia Gonzalez Zamorano, a landscape ecologist at CIBNOR (Centro de Investigaciones Biológicas del Noroeste) in La Paz who has been studying the mangroves of the Baja peninsula since 1997, cites a book† on mangroves recently-published by her institution and others when discussing the importance of mangroves to biodiversity in Baja California. “The mangroves of Baja California are the northernmost in the Eastern Pacific, and they support a tremendous number of species. Research over the years has confirmed that our mangroves support 159 fish species, 152 bird species – 43% resident, 57% migratory, 214 seaweed species, and 213 species of marine macroinvertebrates, including 72 species of crustaceans such as crab, shrimp, and krill, and 62 species of bivalves including oysters, clams, and mussels. While the rate of mangrove loss in Baja California is comparatively low at “only” 2% per year, between 1973 and 1981 we lost 23% of the mangrove forests surrounding La Paz alone due to development.” It can cost several thousand dollars and up to 100 years to restore a single hectare of mangrove to its full environmental services capacity. Dr. Aburto and Dr. Excurra worry that mangrove loss could cause irreparable damage to fisheries. Mangrove-related fish and crab species account for 32% of the small-scale fisheries landings in Baja California Sur, and mangrove loss, coupled with overfishing, have already had a severe impact on the state’s fishing industry. While the evidence is only anecdotal at this time, it is clear that many families who have been fishing in the state for generations are already looking to other sources of income as rapidly declining fish stocks are challenging their traditional livelihoods. As homo sapiens we often make the short-sighted decision to allow a habitat to die, because we feel the resources required to sustain it are needed to allow mankind to live. It can take great creativity and commitment to find solutions to immediate human problems that will provide the biodiversity mankind needs to flourish past more than just the next three generations. The stakes are about as high as they come: Dr. Ceballos and his colleagues state that if the loss of species continues on the current projection, then “On human time scales, this loss would be effectively permanent because in the aftermath of past mass extinctions, the living world took hundreds of thousands to millions of years to rediversify.” In other words, save that pretty bird, that weird-looking fish, that mangrove today, and they just might return the favor tomorrow. Extinction. It happens. But it sure feels different when it’s coming for you. 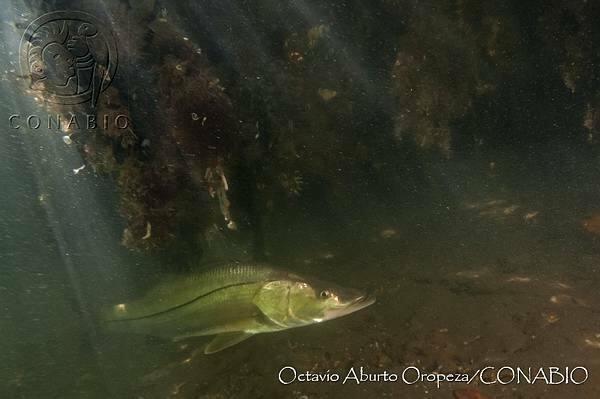 Rescatando Nuestros Arrecifes Y Manglares (Rescuing Our Reefs and Mangroves) is a brand new project taking place in BCS. It’s the brainchild of four marine biologists who, while sitting around the pool enjoying a cold beer, got into their favorite topic: how dirty the ocean is becoming and how plastic seems to be everywhere. Usually that would have been the end of it. But not this time. A date was set, a plan was made, and on July 22, 2015 more than 50 divers cleaned four reefs. Then less than a month later, on August 16, more than 100 kayakers and SUPers cleaned all the mangroves in La Paz Bay. Just a few weeks later, on September 6, the divers cleaned Pargo Villa, a rocky reef in 60 feet of water south of Cerralvo Island. 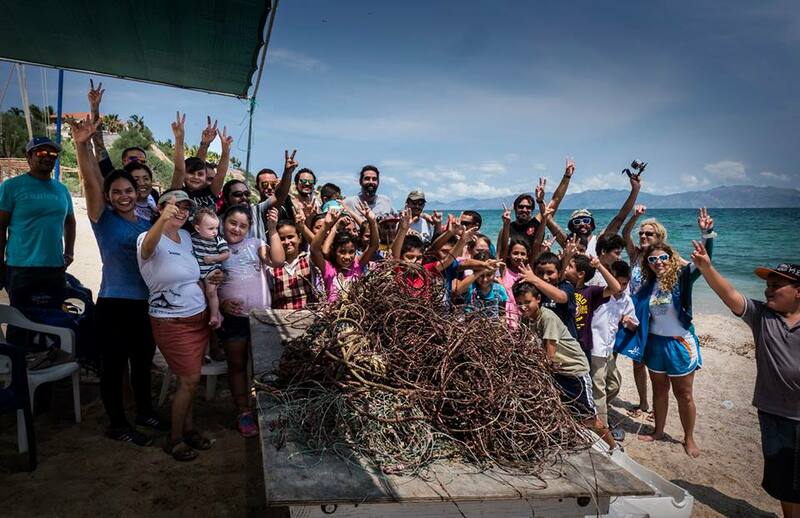 While the divers were out a classroom of 5th graders cleaned the beach at La Ventana. Afterward the two groups got together to share what they had found, talk about how it got there, and how to prevent it from returning. The organizers of Rescatando Nuestros Arrecifes Y Manglares – Mariana Padilla, Pepe Torres, Ronaldo Vilchis and Pablo Ahuja – have pledged to do a cleanup of a reef or mangrove every month, and so far have completed 3 cleanups in less than 3 months. The organizers are seeking donations to purchase a laptop and computer projector so that they can begin environmental education in the schools of La Paz. To learn more about how you can get involved and be a part of the project, please visit them on Facebook at https://www.facebook.com/Rescatando-Nuestros-Arrecifes-y-Manglares or contact organizer Pablo Ahuja at mantamexico@hotmail.com. ROCKIN’ THE MANGROVES. The rock band Linkin Park is taking center stage in conserving mangroves in Baja California. Through their philanthropic arm Music for Relief, Linkin Park has partnered with the environmental group WildCoast to conserve 61 miles of mangroves in Baja California’s Magdalena Bay. Through WildCoast’s #MangleEsVida campaign, the program is raising funds to help protect mangroves so that they in turn can help mitigate coastal flooding to protect wildlife and coastal communities. For more information on Linkin Park, WildCoast and saving mangroves in Baja California, check out #MangleEsVida and/or contact WildCoast’s Monica Franco Ortiz at monica.franco@costasalvaje.com. 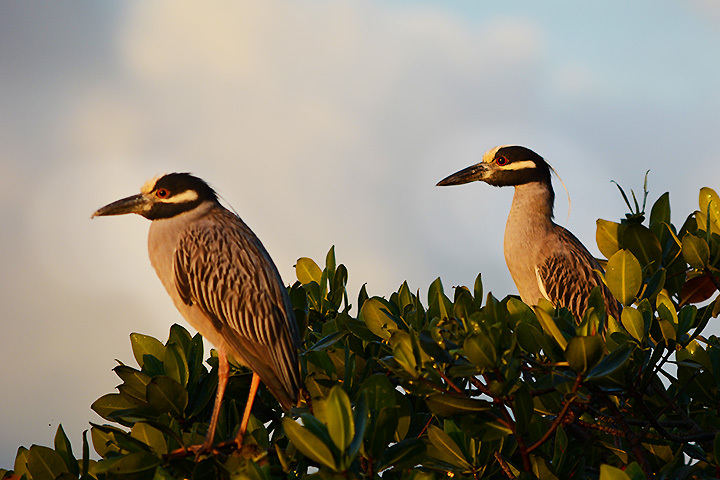 This entry was posted on October 28, 2015 by Todos Santos Eco Adventures in Uncategorized and tagged baja california sur mangroves, Baja conservation, Dr. Exequiel Ezcurra, Dr. Octavio Aburto, Espiritu Santo mangroves, Mangrove circle of life, Mangrove food web, Mangroves, Patricia Gonzalez Zamorano, red mangroves, white mangroves.